A well-maintained commercial HVAC system will provide the comfortable environment your workplace deserves year round. Richmond’s hot, humid summers and chilly, damp winters can make climate control a challenge, but a qualified commercial HVAC technician can provide the guidance you need to ensure your heating and cooling needs are properly met. A well-maintained commercial HVAC system will provide comfort in the workplace as well as protect building materials and equipment while reducing energy consumption. Regularly scheduled maintenance can extend the life of your HVAC system and save you money in the long run. No business can afford the downtime or damage caused by an unreliable HVAC system, but we often fail to appreciate something until it’s gone. Avoid unhappy customers and staff sweating through a heat wave or freezing during a cold snap because your heating and cooling systems suddenly stop working. W.G. 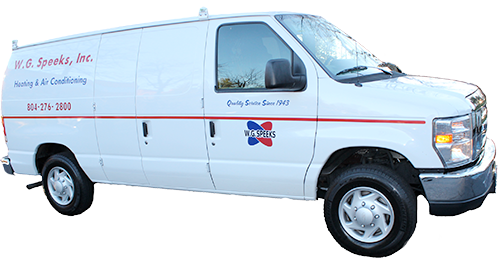 Speeks has the maintenance agreements and experience you need to prevent a costly nightmare. Get proactive about saving time and money. Contact our NATE certified experts to schedule an appointment for a free quote today!